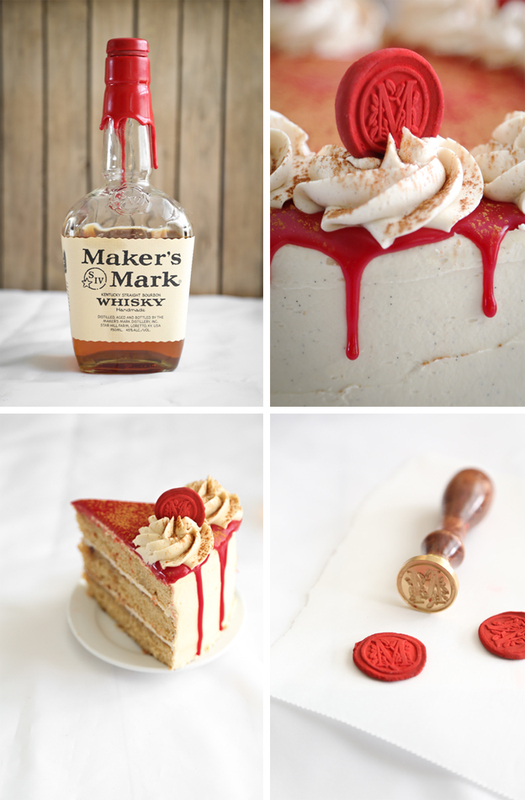 Did you notice the cake's aesthetic was taken directly from the Maker's Mark bottle? 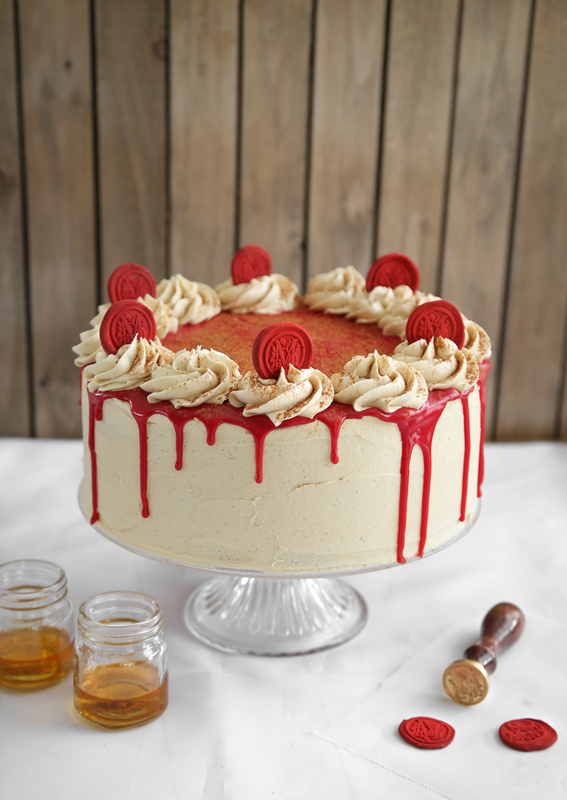 I love the drippy wax cap effect and translated it into a red ganache cake glaze. I even made some 'wax' seals with marble-size pieces of red fondant and a wax stamp. If you're a regular reader of this blog, then you already know of my obsession with wax stamps (for a refresher see here and here). I found the 'M' initial stamp here, although you could use 'W' for whisky or 'B' for bourbon (or 'A' for Amy and so forth). The cake layers are rich with brown sugar and a hefty 1/2 cup of Maker's Mark bourbon. I suggest making the cakes the day before you plan to assemble and serve the cake. Wrap them well in plastic wrap and store at room temperature overnight. This seals in moisture and sets the crumb so the layers can best receive a generous brushing of bourbon simple syrup. I used sorghum molasses in the cake layers and in the frosting. It's an ingredient that's uniquely southern and dear to my heart. You can find the brand I used - and what I consider to be the best quality sorghum - for purchase here. It's a little like molasses but not quite as dark. If, for some reason, you can't procure sorghum in your geographic location then regular molasses may be used in its place. 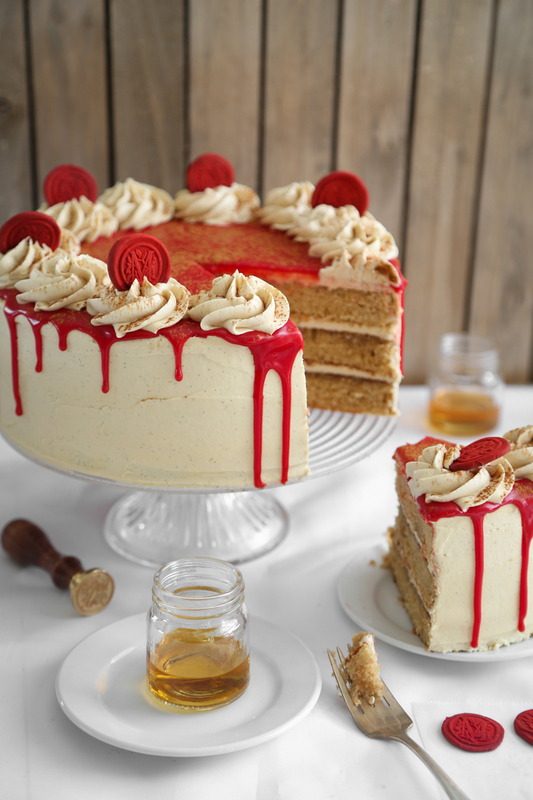 After the cake layers are baked and leveled, bourbon simple syrup is generously drizzled and brushed on top of each layer. Tip: I always make simple syrup in the microwave; it only takes about 1 minute 30 seconds! A thin layer of spiced apple butter is spread on top of two syrup-infused cakes. This gives the overall dessert some needed acidity and contrast. Apple butter really compliments the flavor of bourbon, too. Tip: If you can’t find spiced apple butter, then stir 1/8 teaspoon ground cinnamon into the 6 tablespoons called for in this recipe. Use a generous 1/2 cup of frosting to fill each cake layer (the picture is what my generous 1/2 cup looks like – so, about 1/2 cup +3 tablespoons). Spread the frosting as evenly as possible over the apple butter. Cover the cake in a thin layer of frosting (crumb coat) and refrigerate until firm. While you wait for the cake to chill, make the red ganache. Chop red candy melts (also called candy coating) into small pieces. Combine it with heavy cream and heat in the microwave at 30 second intervals until it can be stirred smooth. Let the red ganache stand for about 20 minutes, or until it thickens slightly. After the crumb-coated cake chills, cover it with a final layer and refrigerate again. Slowly spoon the ganache around the top edge of the cake – do this sparingly at first so you can gauge the ‘drippy-ness’ of the ganache. Spoon the remaining ganache over the top of the cake, being careful not to overflow the edges of the cake. You may not have to use all of the ganache. 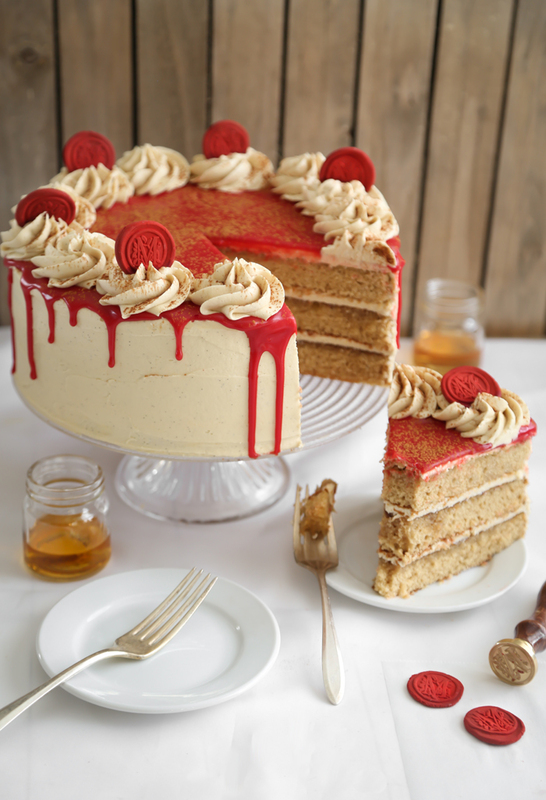 Now, you could stop after the drippy red glaze step and have a perfectly beautiful and delicious cake to offer guests, but the leftover bourbon-vanilla icing should not be wasted. I transferred it to a piping bag fitted with a large star tip and piped swirls of icing on the top edge of the cake. The finished cake is dusted with just a kiss of cinnamon. 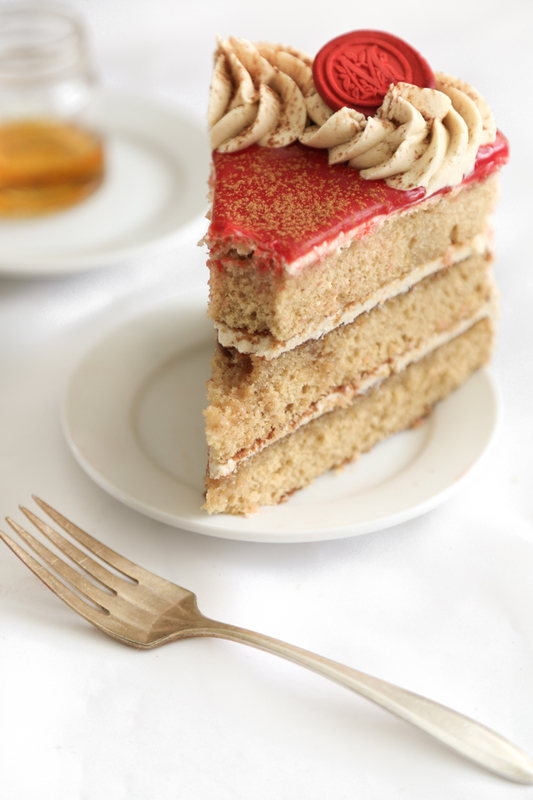 This is a nice tie-in with the spiced apple butter inside the cake layers. Regarding the cake's overall flavor, I'd have to stick with my description of 'glowing'. It's richly infused with unmistakable bourbon flavor, but not overtly toungue-tingling. If you're thinking ahead for Valentine's Day, I'd imagine a slice would make a nice after-dinner sweet for the whisky connoisseur in your life. I suggest making the cake layers a day ahead of assembly. Stack them between sheets of parchment and cover them in plastic wrap. The next day the cakes will be soft and the crumb will be well set. Sorghum syrup can be found at specialty stores and online (see blog post for links). Prepared spiced apple butter is used in this recipe, and can be found in the jams and jellies section at the grocery store. Make the cake layers: Preheat oven to 325 degrees. Grease three 9-inch round cake pans with flour-based baking spray (or grease pans and line bottoms with parchment). Apply Bake Even Cake Strips to the outside of the pans if you have them. Make the simple syrup: In a microwave-safe bowl combine the water and sugar. Cook at 100% power for 1 minute 30 seconds. Stir well until the sugar is completely melted (you can also make this on the stove top in a saucepan over medium-high heat if you don’t have a microwave). 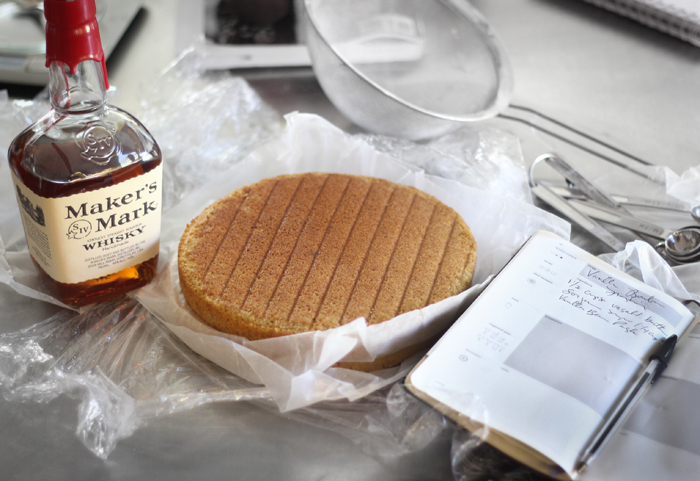 Add bourbon; drizzle on/brush syrup over cake layers. Use as much or as little of the syrup as desired (I had 1/4 cup left over). Make the vanilla bourbon frosting: Cream the butter until smooth in an electric mixer on high speed. Add the sugar and beat on low speed until incorporated, then on high speed until fluffy. Add the sorghum and vanilla bean paste. Beat on high speed until light and fluffy. Scrape down the bowl and turn the frosting over a few times to ensure all the ingredients are incorporated. Beat in the bourbon; whip for 1 minute. Make the red ganache: In a microwave-safe bowl, combine the chopped red candy and heavy cream. Place in the microwave and heat at 100% power at 30 second intervals, stirring well between heating (about 1 minute total cook time). Alternatively, you may use a saucepan on the stovetop over medium-low heat. Let ganache cool until slightly thickened, about 20 minutes at room temperature. Remove the cake from the refrigerator. Gently and slowly, spoon a small amount of ganache over the edge of the cake allowing it to flow over the sides in drippy fashion (some of the ganache will drip off of the cake, so place it on a surface you don’t mind getting drippy – read: not your finest table linens). Cover any bare spots on top of the cake by spooning on red ganache. You may not have to use all of the ganache. Make the wax seal décors: Knead the rolled fondant until it is well pliable and not sticky (knead in a tiny amount of powdered sugar if it remains sticky). Roll into 6 marble-sized balls and flatten each ball with the wax stamp. If the fondant sticks to the wax seal, gently pull it off to reveal the design. Allow the fondant seals to dry until firm, about 15 minutes. Place the seals upright and alternately on every other frosting swirl on top of the cake. Dust the entire cake lightly with the ground cinnamon. The alcohol component does a wonderful job of preserving the cake at room temperature, but I chose to store the cake in the refrigerator overnight because of the apple butter filling. Wrap the cake well or store in an airtight cake keeper after it is cut. Always bring to room temperature before serving. This layer cake is so dang gorgeous. 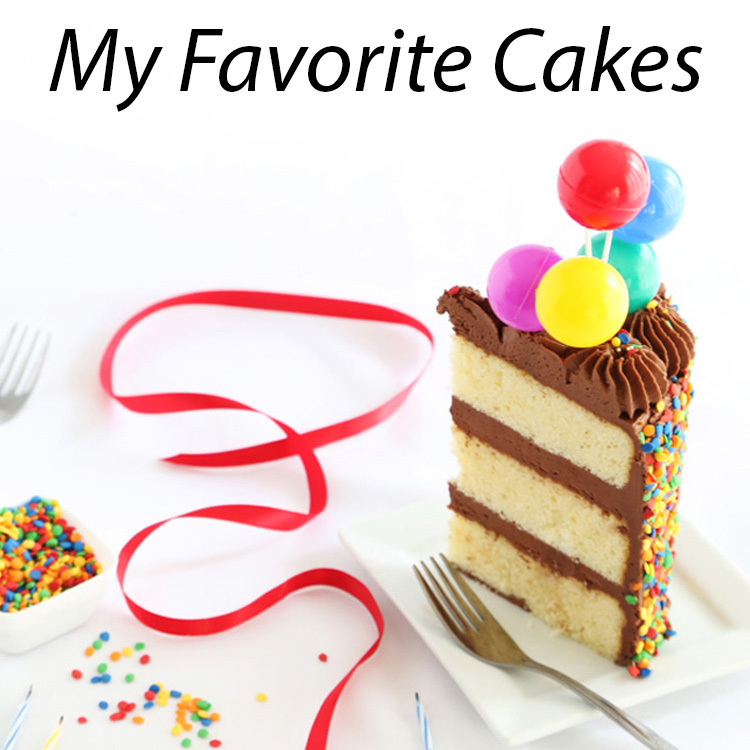 I love that red ganache - it makes this cake look so special! Yummy Yum! That description is amazing and I love the literal take on the Maker's Mark bottle. I love spiced apple butter topping the cake layers. I've been wanting to try a layered cake and I believe this will be the one to do. This cake looks beautiful and delicious! I'm not a huge fan of whisky, however; would this recipe work well with some other kind of alcohol, like amaretto? Hi! I see no reason why amaretto wouldn't work. If I remade this cake using amaretto, I'd probably use apricot jam instead of apple butter. Almond and apricot are lovely together. My word, what a brilliant creation! I'm gobsmacked. So beautiful. You are amazing with your creations, I am going to check out your other blogs. I am inspired by your wonderful recipes! Thank you for sharing! I am new to your blog and am looking forward to trying this recipe and others in your site. I also wish to start a blog site in my near future. Do you have any advice? Thanks! I love those fondant stamps! Such a cute addition! 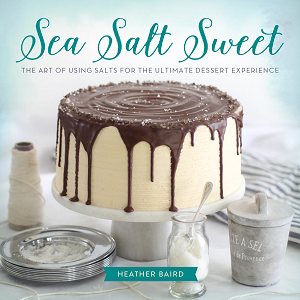 I can't wait to try this beautiful cake recipe out! I am new to your blog website. Excellent website with beautiful recipes! Thanks for sharing! Wow! Your creativity and flavor combinations always entice me to try your delicious recipes. They never disappoint....and the stamped fondant discs are fabulous! Cheers to 2016 and an abundance of new recipes! Oh my - this cake is incredible! I never would have thought of putting whiskey in a cake... I bet it tastes delicious though. You had me at bourbon, first of all. But seriously, I love how you mimicked the drippy wax from the Maker's Mark bottles on the cake. Beautiful! This is the cake of my dreams! I love bourbon and baking with it is such a treat. How to decorated this cake is above and beyond. Love it! Red ganache! YUM! I only ever used chocolate. Thanks for the inspiration! That slice of cake is too large for the plate, exactly how I like my cake! Happy 2016, beautiful lady. 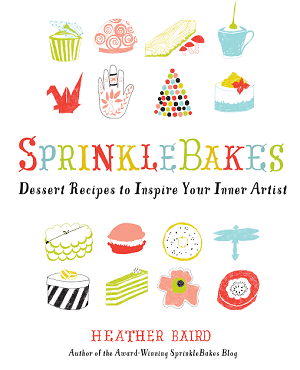 I gave a copy of your book to a friend and she cannot wait to make EVERYTHING in it! Happy 2016 to you too, Coco! I am so honored that you'd give my book as a gift - thank you! I hope your friend finds it useful. This looks amazing! I plan on making it for my sister's birthday tomorrow. We have an apple hater in the family, do you have any suggestions for an apple butter substitute? Thanks! Peach is a great flavor paring with bourbon, so peach jam or preserves would work well. I'd also use fig jam or pear honey. 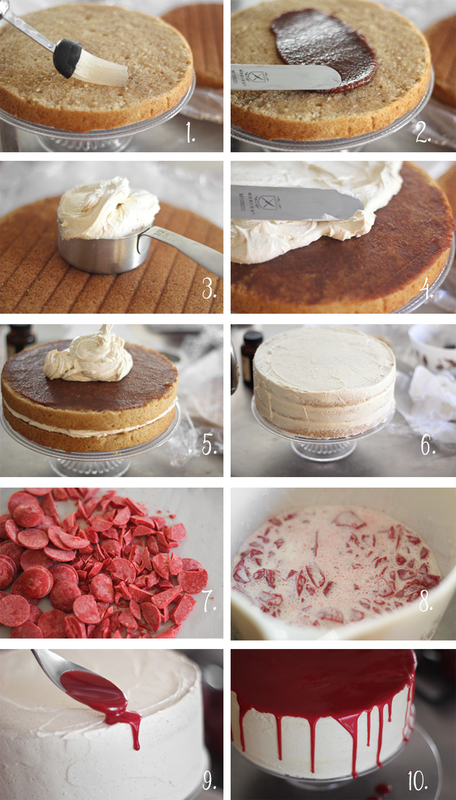 I'd suggest adding a pinch of ground cinnamon in all of the above before applying it to the cake. The frosting can be made ahead, but you'll need to place it in a bowl and cover the surface of the frosting with plastic wrap (kinda like you'd do for pudding so it doesn't get a 'skin'). And then cover it again with a second layer of plastic wrap. 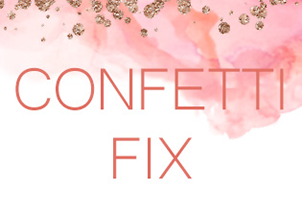 This will prevent the frosting from drying out and getting crusty. I think you'll do great! To prevent your stamp from sticking, be sure to knead the fondant well. You can also dip your stamp into powdered sugar first and tap the excess sugar out on a counter top before you stamp. Good luck! I hope you love the cake! Given the flavor differences between Maker's Mark and Maker's 46, I'd think the 46 would be more appropriate for dessert dishes. Both original MM and 46 would be appropriate for this cake. Thank you for the suggestion. can the cake layers be made ahead and frozen? if so, do you think you could make it four or five days ahead? Yes, the cake layers can be made ahead (without the simple syrup). Just wrap them well and place in freezer bags. They should be fine in the freezer for up to five days. Thanks! 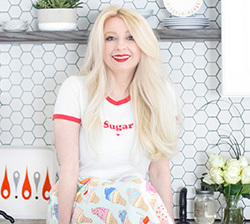 If I make the frosting 24 hours before, should I refrigerate it or let it sit out? I'd store it air-tight in the refrigerator and then bring to room temp and re-whip it. Thi scake looks quite good but big. Would half-ing the recipe muck it up, or would it work? This looks amazing. Was wondering if you could substitute bourbon with spiced rum? Make sure you print the recipe out. Even while I am trying to type this comment, the website is continually scrolling me to the "sponsored videos" and it does this the entire time you are trying to follow the recipe. Cake was amazing a delicious, just frustrating to follow online. I'm sorry this happened to you! We're checking with our ad network to resolve the issue.